Thinking back when I was a kid, my mother ate a lot of walnuts. She kept a grocery bag of walnuts under the kitchen sink, and from time-to-time, would take some out and crack them with her silver nutcracker to expose the brain-shaped nutmeat inside. In fact, she told me walnuts were a brain food of sorts, which is why she ate them so often. I never particularly enjoyed eating walnuts, but then again, I never tried crunchy candied walnuts flecked with sesame seeds until this week. 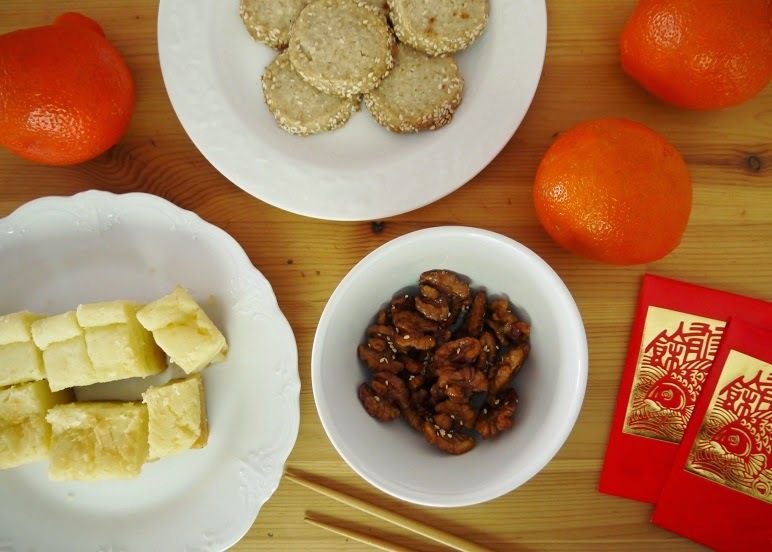 I made this walnut recipe as a part of a snack-set for Chinese New Year, along with chewy cubes of baked new year cake and buttery sesame sable cookies. The walnuts disappeared within minutes of being served. I bet they would also go nicely alongside a cheese plate, or crumbled atop a salad. Adapted from All Recipes. Makes a small snack for 2. Fill a small pot with a few inches of water, and bring to a boil. Add walnuts, and boil for 2 minutes. Drain walnuts using a strainer, and place in a medium-sized bowl. While the walnuts are still hot, toss with sugar to coat. Clean the small pot, and wipe dry. Fill with 2 inches of vegetable oil, and turn up to medium-high heat. Wait until the temperature reaches 350F; alternatively if you don't have a candy thermometer to check the temperature, put one walnut into the oil as a test. If the oil is hot enough, it will bubble furiously when the test walnut is added. When the oil is hot enough, place the nuts into the oil, being careful not to splash the hot oil. Wait 3 minutes, and then check the colour of the walnuts for doneness. If the walnuts are just turning a medium brown colour, they are ready. If they still look pale, keep them in for another minute or two, checking constantly to avoid burning. Once the walnuts are nicely browned, remove them with a slotted spoon and place into a clean strainer over a bowl. Shake for a few seconds to remove excess oil, and pour the walnuts into a separate clean bowl. Toss with salt and sesame seeds while they are still hot. Cool completely before serving. Store in an airtight container for up to 3 days.